How to Make Slow Cooker Hot Dogs (with Tasty Results)I’ve recently become a big fan of using my slow cooker, and it’s not even chili season! I’ve discovered that I have a lot more time to spend with my family during the weekdays when the slow cooker is doing the active work of cooking dinner. Prep time is about the same, but boy, do I gain a lot of extra time when I’m not slaving over the stove. On hot days, I would always choose the grill over the stove or oven, to keep from heating up the kitchen. Lately though, I’ve been using my slow cooker and I’m able to stay even cooler! This is when I discovered that I can make hot dogs–a backyard party staple–without ever having to start the grill. 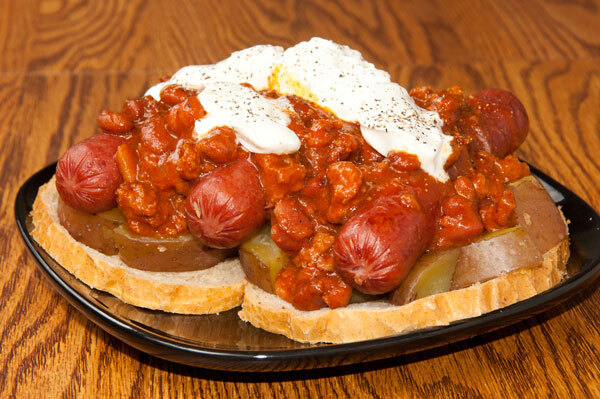 Never heard of slow cooker hot dogs? I hadn’t either, but a quick Pinterest search taught me that I’m not the first to discover this awesome cooking method. It has saved me so much time that I just had to share it with you. You can use this cooking metho no matter what size slow cooker you have on hand. When trying to determine how many hot dogs you can fit into your slow cooker, remember that a 6-quart cooker can fit up to 60 dogs. By that math, a 3-quart slow cooker can accommodate 30 hot dogs. If you are in the market to purchase a new slow cooker, I recommend selecting a large model, even if you don’t have a large family. You can cook bigger meals to have leftovers for the next few days, or easily cook for a group of friends. I’m a big fan of this colorful, 7-quart Black + Decker cooker, which has a simple dial (or knob) for controlling the settings. If you want less flash and more features, this Frigidaire Professional Stainless 7-Quart Programmable Slow Cooker is a good choice. Pay close attention to this first step if you’re trying to get the maximum amount of hot dogs into your slow cooker! Although this cooking method is super easy, I’m not telling you to just throw the hot dogs into the slow cooker. You need to arrange them. 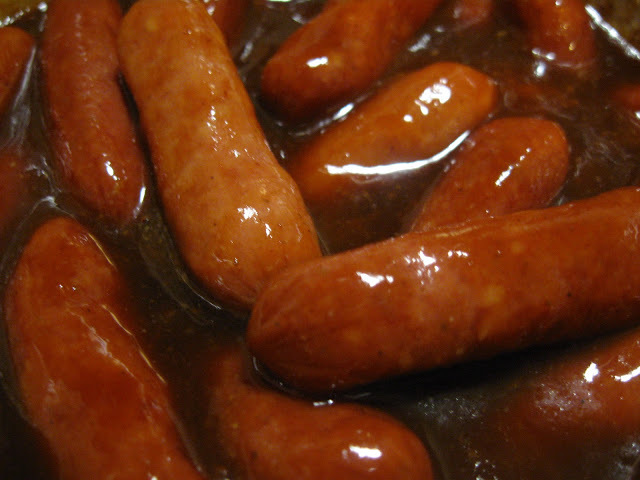 Remove the hot dogs from their packaging and place them in the slow cooker vertically. As in, standing on their ends. Place one or two hot dogs on their end, pressed right up to the side of the slow cooker. Hold the hot dogs in place while you grab a few more with your other hand. Continue to stand a few hot dogs at a time while holding them in place with one hand. This arrangement will allow you to pack your slow cooker full of hot dogs. They should look like this image from 365ishpins.com. Here’s another image from AYearOfSlowCooking.com; just look at how many hot dogs she can neatly fit into her cooker! (Side note: I’m totally buying her cookbook, 365 Slow cooker Suppers). 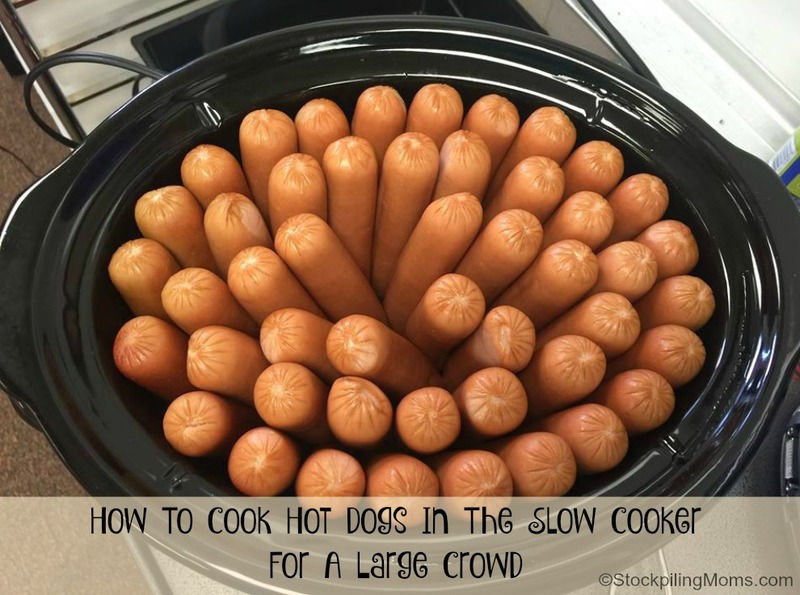 If you’re not filling your slow cooker to the brim with hot dogs, you can simply lay the hot dogs down like the folks over at RecipesThatCrock.com. Pro Tip: If you’re cooking hot dogs for a kids’ party (or even for your own children), you can chop the hot dogs up into bite-size pieces before putting them in the slow cooker. Thanks to DamnDelicious.net for the photo that inspired this idea. Since you’re not adding any water to your slow cooker and dogs, you need to put the cover on your cooker securely, and leave it on. This Slow Cooker Tips for Dummies video says it takes up to 20 minutes to recover the heat lost every time you take the cover off your slow cooker. As the slow cooker heats up and the hot dogs begin to cook, the dogs will release juices (just like they do on the grill). This moisture will condensate on the inside of the slow cooker cover, and drip down on the dogs, creating a steam effect. 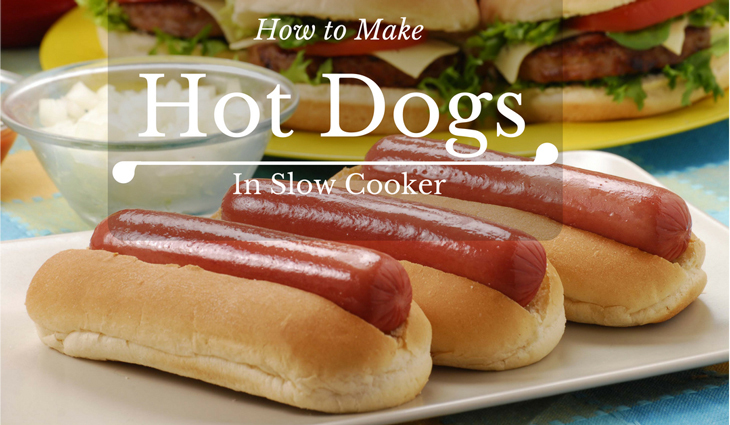 The result is juicy hot dogs, so keep the lid on your slow cooker until it’s time to eat. You can start your slow cooker hot dogs anywhere from 2 to 6 hours ahead of when you plan to eat. You will adjust the temperature based on the amount of time you have. 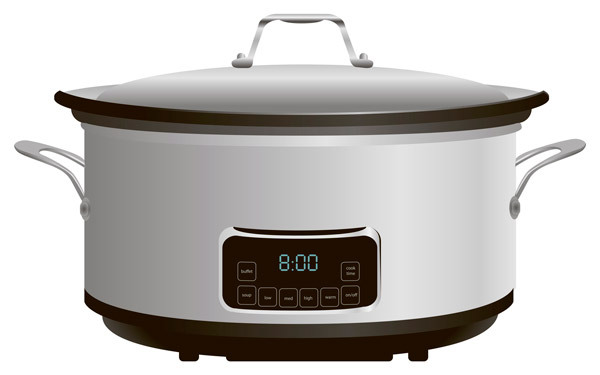 If you have 4 to 6 hours before you plan to eat, set your slow cooker to Low heat mode and set a timer for 4 hours. When your timer goes off, set your slow cooker to Warm mode, to keep the hot dogs warm while everyone has time to eat. If you have only a couple of hours before you plan to eat, set your slow cooker to High heat mode and set a timer for two hours. After the two hours, set the slow cooker to Warm mode. The key to this step is to “set it and forget it”. Walk away. Go to the store. Help your kids with their homework. This cooking method is all about letting the slow cooker do the work while you have time to do something else. Pro Tip: If you’re having a bunch of people over, or are making slow cooker hot dogs at an event, put the slow cooker in a convenient, out-of-the-way spot. Four to six hours is a long time to have kids or partygoers steer clear of the hot slow cooker. Slow cookers are made to cook large batches of food all the way through, but you should always check the temperature of your food before serving it to others. Pull out a few hot dogs from the center of the slow cooker and see if they are hot enough to serve. If any hot dogs are not hot enough, rotate them with a few hot dogs that are on the edges of the slow cooker. Placing hot dogs against the side surface of the slow cooker, like this (thanks to Spaghettiandgravy.blogspot.com for the photo), will allow them to get more heat, even if the slow cooker is in Warm mode. You can keep your hot dogs in the slow cooker and serve right out of it. Keep the slow cooker on Warm mode and cover it after everyone has been served. This keeps the dogs warm during the meal (for anyone who wants seconds or thirds), or for anyone who arrives late. Pro Tip: You can store leftovers right in your slow cooker’s ceramic pot. Allow the slow cooker to cool down, cover and remove the ceramic pot, and put the entire thing in the refrigerator. This hands-off approach to making hot dogs is so simple, and can save you so much time doing it. There is practically no prep (unless you cut the hot dogs into smaller pieces), and you can even crank up the heat if your guests will be arriving soon. If you make slow cooker hot dogs, leave a comment about how they turned out (and how impressed your friends and family were). 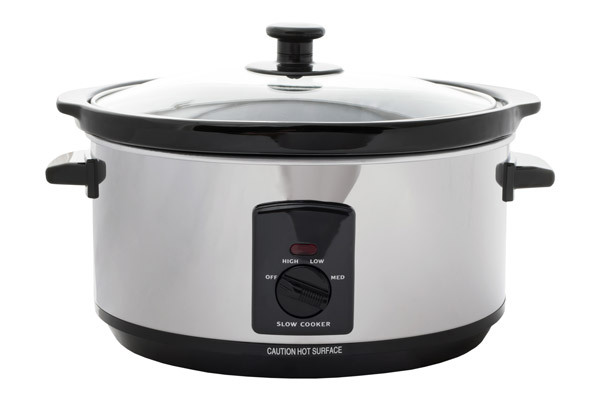 And let me know what you think about that cool Black + Decker slow cooker; do you think that it’s too “flashy” for your kitchen? My mom loves to host a gathering. She’s more than happy to cook a huge meal at every major holiday, even if there’s only a small group of us on-hand. My mom has a lot of tips and tricks up her sleeve for how to have many different dishes ready at the same time. As for me, I’ve never quite had my mom’s knack for timing when it comes to feeding a crowd. I’ve even screwed up a casual backyard cookout before! That’s why I’m thrilled to share this new trick today. Have I sold you on this yet? Are you ready to learn how to make the easiest hot dogs ever? Great! Just follow this simple step-by-step tutorial. That’s it! 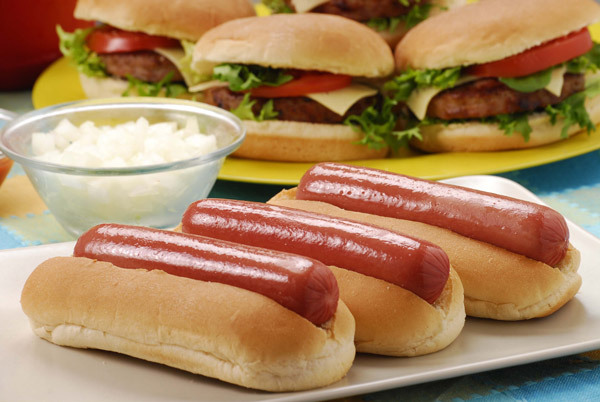 Of course, you need hot dog buns and condiments if you’re planning to serve them traditional-style. 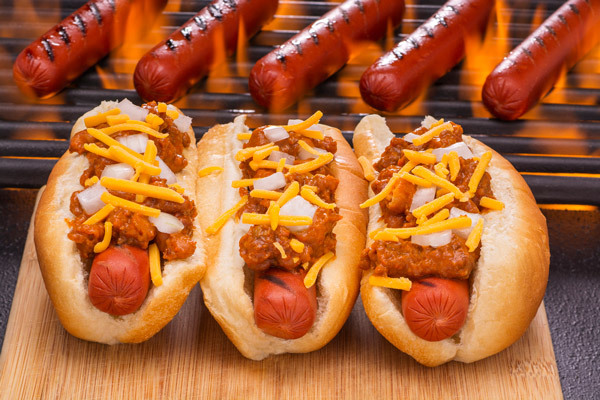 You could also serve the hot dogs with macaroni and cheese (for a child’s birthday party) or as chili cheese dogs. You do not need water or any type of seasoning for this “recipe”, although Adrian Bustamante from the YouTube channel ﻿﻿CookingGuid﻿﻿e says putting the dogs in some water can keep them from burning. My experience has been that the hot dogs release some of their own juices as they cook in the crock pot. This happens when you grill them or pan fry them, too, so I choose to skip the water. You can use just about any crock pot for this recipe. I have two older model crock pots that each have just one knob to set the temperature. I also have this mode﻿﻿﻿﻿﻿l (thanks to Heavy.com for the great picture) which has push buttons and a digital screen and a timer (which I recommend using in my step-by-step instructions, below). The newest models made by Crock Pot have digital touch screens and a lot of different features and functions, like this 5-in-1 Multi-Cooker. All that said, we’re really just heating hot dogs, so you don’t need the fanciest model crock pot. Use what you’ve got, and adjust the amount of hot dogs for the size of the pot. 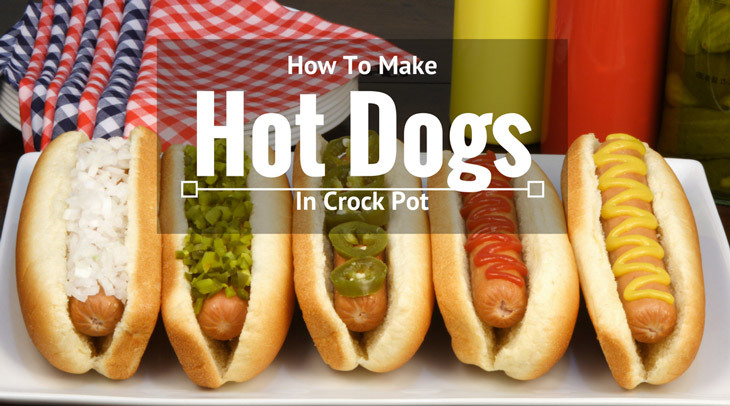 Remove the hot dogs from their packaging and place them in the ceramic dish of the crock pot. How you arrange the hot dogs depends on how many dogs you are cooking. If you are using a large crock pot (like a 6-quart pot) and only have 20-30 hot dogs, you can just toss them into the pot. The folks over at RecipesThatCrock.com used this method; they simply piled the hot dogs up in the crockpot. If you’re trying to cook 60 hot dogs at once in a large crock pot, I recommend doing what Stephanie O’Dea from AYearOfSlowCooking.com did, which is to stand the hot dogs up on their ends and pack them in tightly. 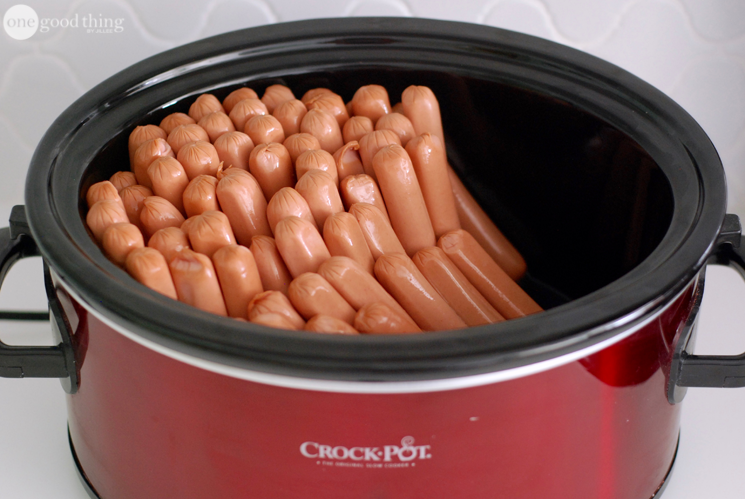 This method takes a few more minutes, but it’s the only way you’ll be able to fit all the hot dogs into the crock pot. Pro Tip: You can also cook the mini hot dogs (also known as “cocktail wieners” or “little smokies”) using this same method. 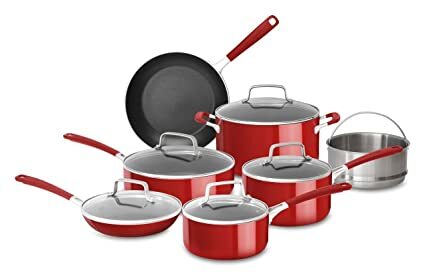 You can probably fit three to four packages of those little guys into a 6-quart crock pot, but I wouldn’t recommend trying to stand them on their ends! A lot of recipes for mini hot dogs call for making a sauce, like this one for Honey Garlic Crockpot Little Smokes from FamilyFreshMeals.com, which sounds delicious! If you’re new to crock pot cooking, you should know that keeping the cover on the pot–and not lifting it too often–helps to keep all the heat and cooking magic in the pot. If you’re wondering if the crock pot is heating up, you can gently touch the sides to check the temperature. Need to learn more about using your crock pot? This video provides a great introduction. One of the great things about this cooking method for hot dogs is that you can speed it up if you’re short on time, or plan way ahead on the morning of your party. If you’re short on time, set your crock pot to the High setting and cook for two hours. 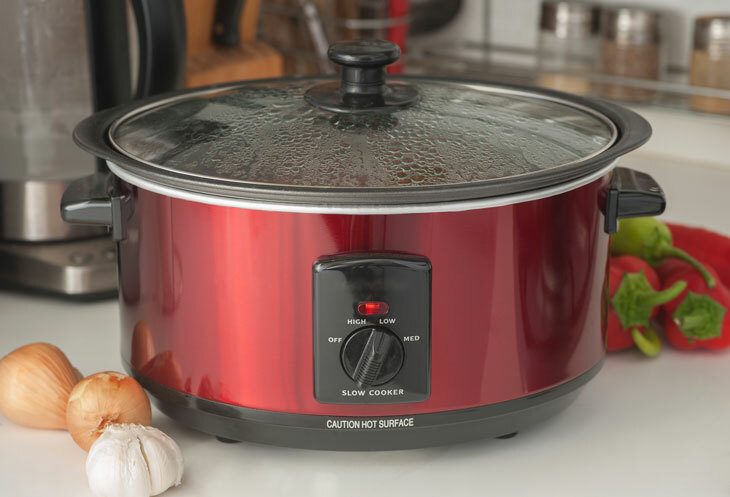 If your crock pot has features like a timer and warmer, you should set the timer for two hours, and then have the crock pot switch to Warm setting. If you have plenty of time before you need the hot dogs to be ready, set your crockpot on Low for four hours. (Follow the same timer/warming steps above). Pro Tip: If you’re in the market for a new Crock Pot (you can never have enough; I have four), check out this W﻿﻿ifi-ena﻿﻿bled mode﻿﻿﻿﻿l that lets you change heat and timer settings using an app on your phone! Crock pots are great because they conduct and hold a lot of heat. The hot dogs in the middle of the pot should be hot enough by the end of two or four hours, but always check them before serving. Even if the hot dogs in the center of the pot aren’t piping hot, hot dogs are packaged fully cooked, so they should be safe to eat. I like to serve the hot dogs right out of the crock pot. That way they stay warm and I don’t have to fish them all out of the pot after spending time to get them all in there! I also like to keep the crock pot on Warm mode for the rest of the party or cookout. This keeps them ready for friends who arrive late, or anyone who wants to snack hours after we’ve eaten the main meal. I really can’t believe that it never occurred to me to cook hot dogs in a crock pot before. There have been so many times when I’ve had a house full of people, only to be sweating bullets over my jam-packed outdoor grill, trying to keep everything from burning. Now I just need to figure out how to make 30 hamburgers in the crock pot! Don’t forget to check out that new Wifi Crock Pot. Technology may be taking over our lives, but if I’m going to arrive home two hours later than planned, I’d love to have the option to check on dinner from my phone. Are you as excited as I am about this new trick to cooking for a crowd? 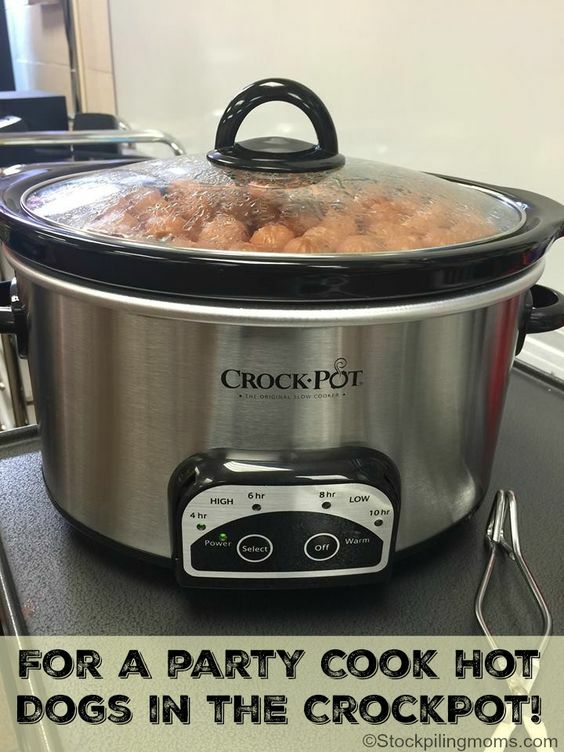 Leave a comment or share your crock pot tricks! For a lot of people, there is nothing like the peace and serenity of sipping an ice cold beverage as the sun sets while watching a bobber or working a crankbait through the lake. From perch and walleye to blue gill and crappie, there is something for everyone to enjoy for dinner after a productive day out on the water. 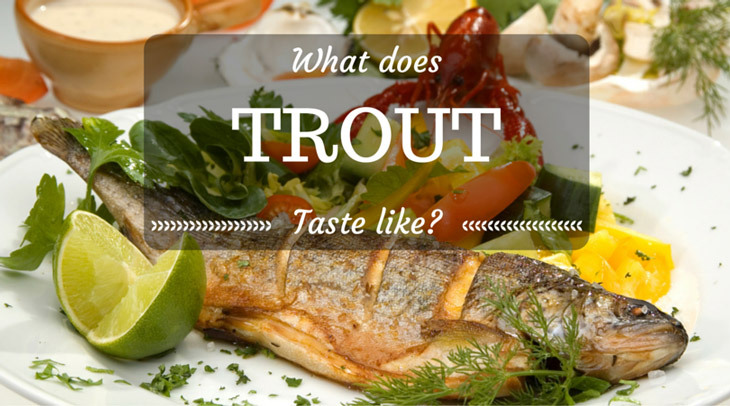 Among the options is trout, a freshwater delicacy that is closely related to salmon. 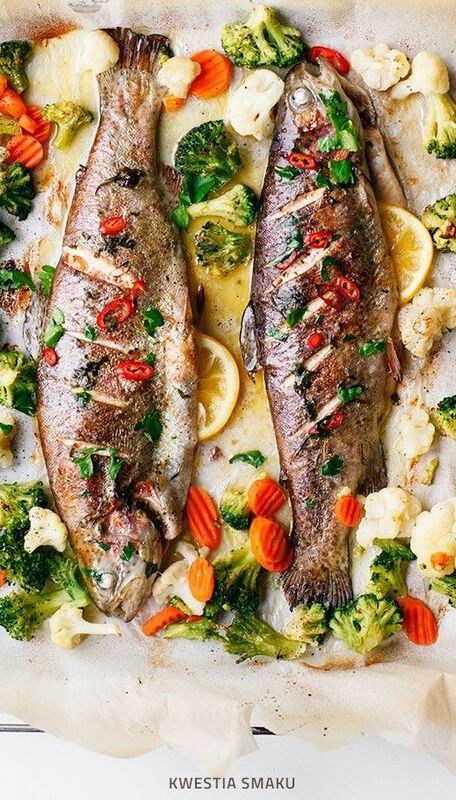 Classified as an oily fish, trout are considered an excellent source of essential vitamins, including A and D. They also are rich in Omega-3 fatty acids, which are an essential part of any health diet. So what does a trout taste like? In my opinion, trout has a unique texture and offers a bit of a salty aftertaste. 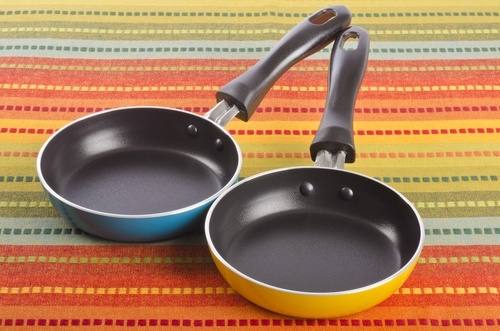 I’ve had it multiple times in various preparations, but just thinking about the simplest preparation of all (cooked whole on a cast iron skillet over an open flame and seasoned with butter, lemon, salt and pepper) makes my mouth water. Many people describe trout as being relatively flavorless on its own, which means it lends itself well to a variety of cooking methods. When it comes to what most fishermen refer to as “good eaters,” trout do not fall as high on the proverbial food chain as the more popular crappie or walleye. Their bone structure makes them a bit more challenging to filet, which plays into why many choose to prepare them whole. That doesn’t make them any less palatable, however, especially when they are freshly caught, properly handled and seasoned to perfection. For some, that means lemon, butter and herbs. For others that means all things deep fried. 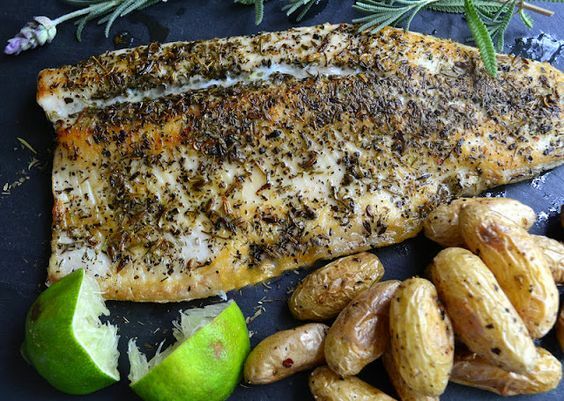 Most of the trout species have what is considered to be a relatively mild flavor that lends itself to a variety of cooking methods. Their location, whether they are spawning or have recently spawned and how fresh they are at time of cooking all are capable of having a profound impact on their overall flavor profile. Obviously, personal preference also plays into whether these tasty treats are deemed delicious or deniable. That being said, there are some people who say trout is too oily, offering too earthy a taste on its own. The good news for trout lovers and haters alike is simple: the options for preparing trout are both boundless and promising. Smoking trout is one of the most popular methods preferred by chefs and fishermen alike. Most ﻿recipes ﻿for smoked trout are relatively simple and easy to follow. The best part is you don’t necessarily even need a smoker to get the job done. Not only is smoked trout a delicious treat on its own, but it is an excellent addition to dips, spreads or salads. Less is more when it comes to cooking trout. The same can be said for a lot of fish, but in the case of trout it is especially true. Keep it simple is the name of the game when it comes to debunking the myth that trout isn’t quite as delicious as its fishy relatives. Fried ﻿trout is delicious – as are most things fried – and grilled and pan seared trout are good too as long as you limit the ingredients to simple things. Think butter, lemon, salt and pepper and perhaps a handful of your favorite fresh herb. Step by step ﻿﻿guides are available to assist in the process of making sure that – if you opt not to keep the fish whole – you enjoy as much juicy meat as possible. While most species of trout are considered equal, they vary slightly based on their country of origin. Globally, trout comes in more than a dozen recognized variations, which includes a variety of sizes, coloring and spotting patterns. Lake trout arguably has the worst reputation among the trout types, but that doesn’t necessarily mean they aren’t everything your stomach desires. In America, lake trout variations are known to result in some trout being more lean than others. As with most proteins, many chefs deem the most delicious lake trout to be slightly more fatty to help flavor the meat and distribute its juices evenly throughout the cooking process. A recent trip to the Northwoods of Wisconsin led to me solidifying my personal opinion of what trout tastes like. My husband and I spent the day fishing with family and had quite a haul of trout as a result. That day I learned that, despite also enjoying fried and smoke trout, there is honestly nothing like cooking the delicacy you just caught fresh in a cast iron skillet over an open flame with the simple treatment of some butter, lemon, salt and pepper. With that I have my answer to the question of what trout tastes like: it tastes delicious!